If your home or business contains travertine surfaces then you share something in common with many ancient Romans, who extensively used travertine throughout the iconic Colosseum along with many other structures. Travertine is a type of limestone found near hot springs or limestone caves. It’s similar to marble but has a few main differences. Travertine is much more porous than marble and if you’ve ever heard someone describe their travertine as “open,” it’s these pores they’re referring to. When travertine is quarried it looks akin to Swiss cheese due to open holes created by gas pockets from long-compressed organic matter. Formed under oceans, the trapped decaying organic matter traps pockets of gas within the stone as it compresses. “Open” travertine is extremely susceptible to collecting dirt and debris, sometimes making it a challenge to maintain. In fact, we can predict that 99% of the open travertine stone installed on floors in the US will be converted a to closed-travertine for this very reason within a few years of installation. (The good news is – yes – we can do that. The resulting floor maintains the look of travertine but the smooth consistently closed surface of a traditional tile making it much easier to clean and maintain). Another difference is that travertine really only comes in neutral color selections, as opposed to marble with its rich range of colors. There’s also a notable lack of uniformity of appearance so it’s often difficult to find identical pieces, as you can have pinholes next to fist size holes. 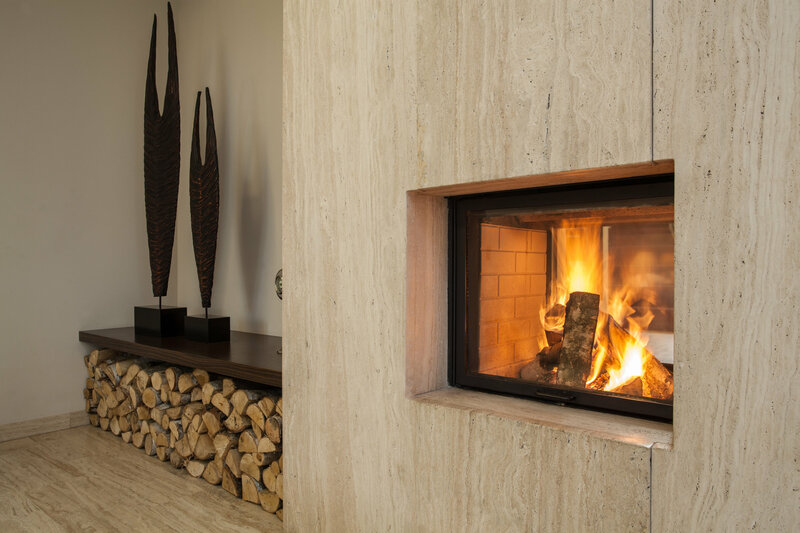 Since travertine is composed mainly of calcium carbonate (the primary compound in the make up of seashells), as a result it is incredibly sensitive to acids. As a result, many store-brand tile cleaners will not be suitable for caring for these surfaces. In fact, using one of these products can dissolve the softest areas in the surface resulting in micro-pitting, etching and gradual loss of finish. If you have seen “hard water cleaners” you are looking at a product designed to remove calcium deposits from tile. That calcium is the same basic material, so you can actually get a cleaner to dissolve your floor. That is one way of getting rid of a dirty appearance, but it not recommended, and is certainly not inexpensive to repair (and yes – we do these are a regular basis – after each hard water cleaning product commercial). USE A NON-ACIDIC, SURFACTANT BASED CLEANER. Many surfaces have a tendency to collect oils, especially floors – whether from bare feet, cooking, pets or other sources. In order to properly flush the porous openings of travertine, opt for a cleaner that can reduce water tension. This requires use of a surfactant. Without a surfactant water can actually bridge the smaller porous opening without actually entering defeating the cleaner’s ability to enter and flush the pocket. So a surfactant cleaner is needed. Cleaning products must to be able to emulsify and lift away oils. This means again we need a surfactant-based cleaner like our specially formulated MARBLELIFE® Marble & Travertine InterCare Cleaner, which allows water to enter these small pores to flush out contaminants. When a product is emulsified, it means that one end of the surfactant that doesn’t life water surrounds the dirt or oil and the other end that like water faces away. When enough form in this manner oil is surrounded and sees no water, and the water cannot see the oil. In this manner the oil can be floated away into the water. That is the magic of a surfactant cleaner and its ability to get two materials that generally do not like each other to emulsify and mix. …and of course it cannot contain any acid else we are eating away the stone versus cleaning it. 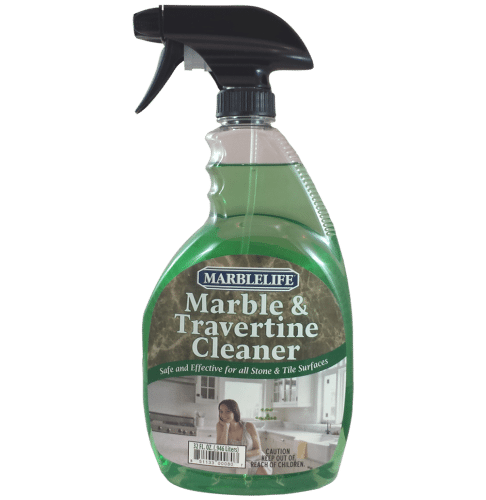 MARBLELIFE Marble & Travertine Cleaner is your choice. Formulated by Stone & Tile Professionals in order to quickly take care of their clients properties without doing harm and while delivering superior clean. For more travertine care tips, contact your local MARBLELIFE office and a knowledgeable stone craftsman will be happy to provide you with any information you may need. Call for a free estimate for all your stone-related projects. 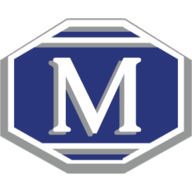 Marblelife Marble & Travertine Cleaner is an “InterCare” based cleaner and is a safe, easy to use and highly effective way to clean your natural stone surfaces.